With one simple gesture, Hebrew University Professor Sydney Engelberg became an champion for parents pursuing higher education. 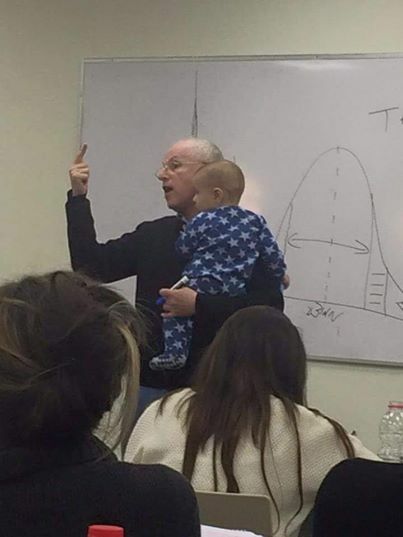 On May 11, Engelberg’s daughter Sarit Fishbaine shared a photo on Facebook that shows her father holding a baby while conducting a lecture. She explains in the caption that during her father’s organizational behavior class, a student’s baby began to cry, and when the mother got up to leave, Engelberg didn’t hesitate to take the infant into his arms and soothe it. He then “continued the class as if nothing had happened,” she wrote. This entry was posted on May 18, 2015 at 9:26 pm and is filed under Inspirational Teachers. You can follow any responses to this entry through the RSS 2.0 feed. You can leave a response, or trackback from your own site.